Print Origami Paper → Bokashi Chiyogami Origami Pack 6"
Enjoy folding with psychedelic gradient patterns with the Bokashi Origami Pack. This pack of 6" Origami Paper contains 4 sheets each of many 40 different patterns. 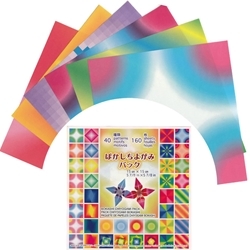 The Bokashi Chiyogami Origami Paper Pack will provide hours and hours of folding enjoyment. Each box contains 160 6" sheets of brightly-colored paper in 40 different patterns. This paper pack is perfect for any origami artist's tool box or for classrooms of art students. Try our other mega origami paper packs including: floral patterns, tie-dye patterns and geometric shape patterns.